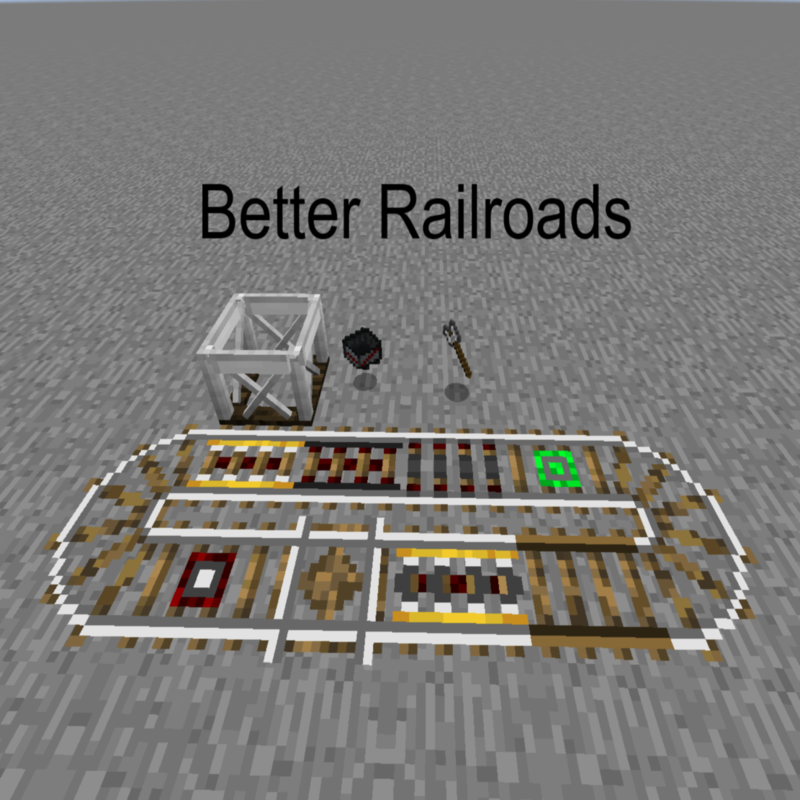 Better Railroads is a mod that aims to add increased functionality when working with rails. Some big things that this mod includes are better rails and carts that will allow for faster and more organized transport of players, mobs, and items. All the rails included in this mod can be placed without any blocks underneath them as well as underwater without them breaking. Wooden Rail - The wooden rail a basic rail that has the same speed as a vanilla rail. Its crafting recipe is simpler and provides many more rails. Iron Rail - The iron rail is an upgrade of the wooden rail. It allows for carts to move at higher speeds than vanilla carts. Its crafting recipe provides more rails per craft as well. Holding Rail - The holding rail is a special type of rail. When un-powered the rail will stop any cart that passes over it. When powered with a cart over it, the cart will continue moving in the direction it came from. Deceleration Rail - The deceleration rail acts a normal rail while un-powered. When the rail is powered, any cart that passes over it will slow down down. This is useful for heading into turns at high speed or hills when a slower speed is needed. Launching Rail - The launching rail acts as a starting point for carts. When a Rail End is placed at the end of the rail, and the launching rail is powered, any cart on the rail will start moving at a high speed. This is useful for the Speed Cart. Intersection Rail - The intersection rail does what it name implies. It allows carts to pass in any direction over it, and continue in that direction. This allows for junctions where rails cross, without the need of redirecting rails in a sloppy manner. Just place one of these at the cross, and the carts will continue in their intended direction. Detection Rail - The detection rail acts like a normal vanilla detector rail, but provides a faster top speed. Jump Rail - The jump rail allows carts to fly through the air! When a cart hits this rail while it is powered, the cart will be thrown into the air in the direction it was traveling. The strength of the jump can be configured with the wrench. Rail End - The Rail is a nice way of ending rail lines, but is also used in combination with the Launching Rail to create a starting point for carts. 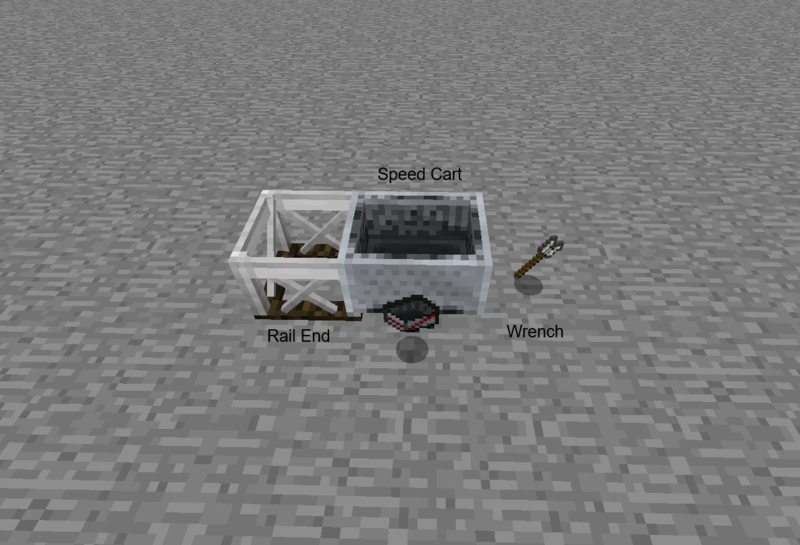 Speed Cart - The speed cart is a special cart that does not collide with mobs but comes with an incredible top speed (Configurable). This means that it cannot be pushed at high speeds, interrupting its travel. Wrench - The wrench is an item that allows you to rotate the rails into any shape, allowing you to change rail directions without having to pick up and place back down the rail over and over. It is also used for configuring the jump rail. - Jump Rail instructions: Right clicking the rail will increase the strength by 1. Sneak right clicking the rail will reduce it by 1. Is there a way you can add a config to slow down the wooden rails a bit? I like to use them in a pack where they are say 30-50% slower they vanilla rails. A redstone-activated switching rail (i.e. a rail which can be switched from a forward direction to the side) would be a nice addition to help with complex rail systems. What you just said is a vanilla feature. Just make a T shape with rails and apply Redstone to the switch rail. Interesting mod! Any chance of adding a config for tracks to break if there is no block underneath them or underwater? Floating rails just seem unrealistic to me. 1.13 forge is not out yet! I am sure once it is completed that a lot of mods will be updated. Planning to update 1.13 when forge updates! pls add curved rails not the 90 degree vanilla rails do but like in the japanese real train mod but minecraft vanilla design, i think this will make absolutely "BETTER RAILS" if you add it. As a suggestion: an actual powered rail, which acts as a powered rail and a redstone torch. Thanks for the suggestion, this has been suggested a lot so I think it will make its way into the mod. Very cool mod, looking forward to seeing what other goodies you add to it. Thanks for taking the time to make this much needed mod. Hi, cool mod, exactly what I was looking for! Is there any quick guide on best practices for this mod? How many powered rails per normal rails, or how to make intermediary stations? Thanks! Mostly, everything is doubled in terms of speed capability and such. There is a config to change the speeds around a bit, so they are more to your liking. Any chance of adding a recipe to convert from vanilla rail to iron rail from this mod? This would make it much easier to upgrade an existing network. Also so players can do something with rails that were collected from an abandoned mineshaft. Can this be automated? Like, detect a chest cart, for example, is full and then slingshot that down the line to the next town? I haven't created switch rails yet to change direction, its on my list of things to create to allow better automation.